What are Motorcyclists Really Like? At the Breyer Law Offices, P.C., Phoenix motorcycle accident attorneys Mark and Alexis Breyer, "The Husband & Wife Law Team," want you to know that motorcyclists are more than just another thing to look out for while driving. 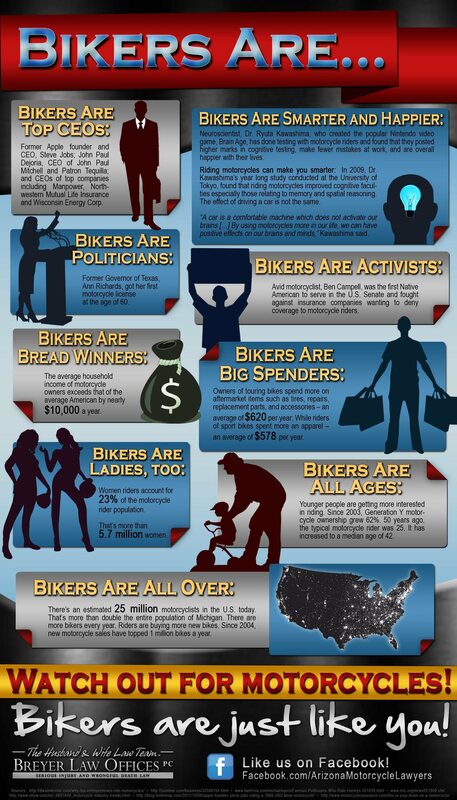 Motorcyclists are people with full lives and unique personalities. More so, riders represent a wide variety of people living in Arizona and the United States as a whole, many of whom have found success in unique personal and professional lives. Next time you see a motorcyclist on the road, do not simply think of him or her as a potential hazard, but someone who may represent any and all of these categories.